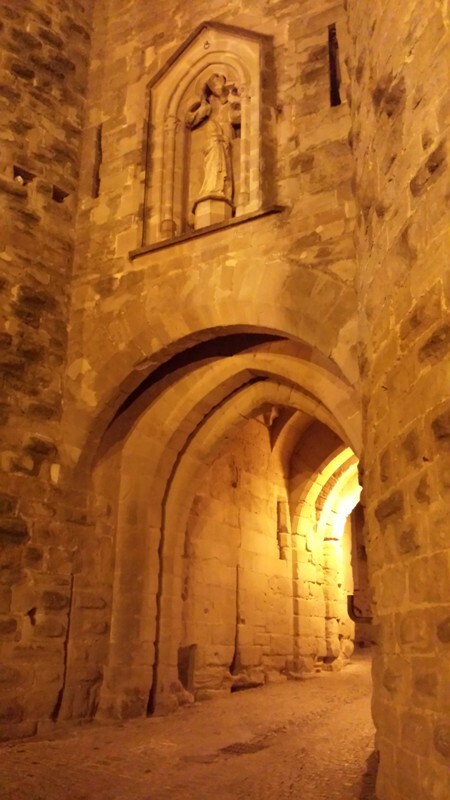 Weekly BLOG: Savoring the Night in Carcassonne, France! One of my most memorable moments was in the south of France in an ancient place called Carcassonne, a medieval fortress with a castle, surrounded by two walls to protect against invaders. I actually stayed in a hotel within the old city center. It was a chilly, very windy night with a drizzling rain. After dinner and lots of red wine, it was time to see what I had read about. All of the old buildings were lit up in golden lights, creating shadows everywhere. The rain reflected these lights and became liquid drops of gold. My umbrella turned inside out so I ran through the wet cobblestone streets, holding my love’s hand. I was out of breath and could hear myself laughing. We stopped in a partially-covered doorway and kissed. It was like one of those scenes in a movie. I knew in that instant, this would be a time I’d remember forever. I wanted to hold onto these seconds as long as I could. My heart was filled with so much joy, love, and gratitude for all of it. This is living deeply, joyfully, and successfully! This is what I mean by having The Inside Advantage—creating your own moments of joy and being grateful for all of life’s gifts. This entry was posted in Creating a Successful Life, Extraordinary Places and tagged Carcassonne, Cathy W. Lauro, finding joy, France, living deeply, living in the moment, living successfully, Romantic, savoring the moments, The Inside Advantage. Bookmark the permalink.